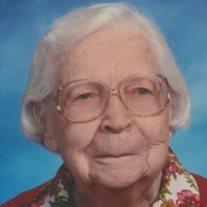 Elizabeth Ellen (Sawyer) Heagren passed away May 21, 2014. She was born October 17, 1909 on the Norton Ranch in Gilbert, halfway between Guadalupe and Baseline on Cooper Rd. Her parents were Hubert Wade and Elsie Ann Sawyer. She did most of her schooling in Gilbert but finished high school in Indiana. She graduated from Whittier College in 1932 with a degree in Math. While in California she met her husband, Art Heagren, and they were married in 1933. During WWII she was a tool design engineer for Douglas Aircraft. Later on she worked as a bookkeeper and office manager for an electronics company. In 1972 she and Art both retired and they moved back to Arizona. After Art died in 1975 she wanted to stay busy volunteering for many things in Gilbert. She did quilting, knitting and crocheting to support the Church and town activities. She enjoyed her time at the Gilbert Museum and Historical Society. She was volunteer Treasurer for the Museum for many years. She loved the Gilbert United Methodist Church. She renewed old friendships and made many new friends in the women’s groups and especially the lunch at Chat and Chew. High on her list of fun was her bowling league. She spent her last years at the Pasadena Group Home in Chandler where she celebrated her last 5 birthday parties. She made many friends there. She was preceded in death by her husband Art and her brother John Sawyer and his wife Ola. She leaves 3 nephews, Darrell Sawyer (Dorothy), Keith Sawyer (Amy Jo) and John Dean Sawyer, many grand nephews and nieces, many great grand nephews and nieces, and 1 great-great grandniece. We all respectively and lovingly call her “Aunt Elizabeth.” Visitation is Sunday, June 1, 2014 from 6-8 PM at Bunker’s Garden Chapel, 33 N. Centennial Way, Mesa. Graveside service is Monday, June 2, 2014 at 10 AM at the City of Mesa Cemetery. Donations may be made to the Gilbert United Methodist Church or the Gilbert Museum.